I love sharing cake recipes with you because cake is my thing! 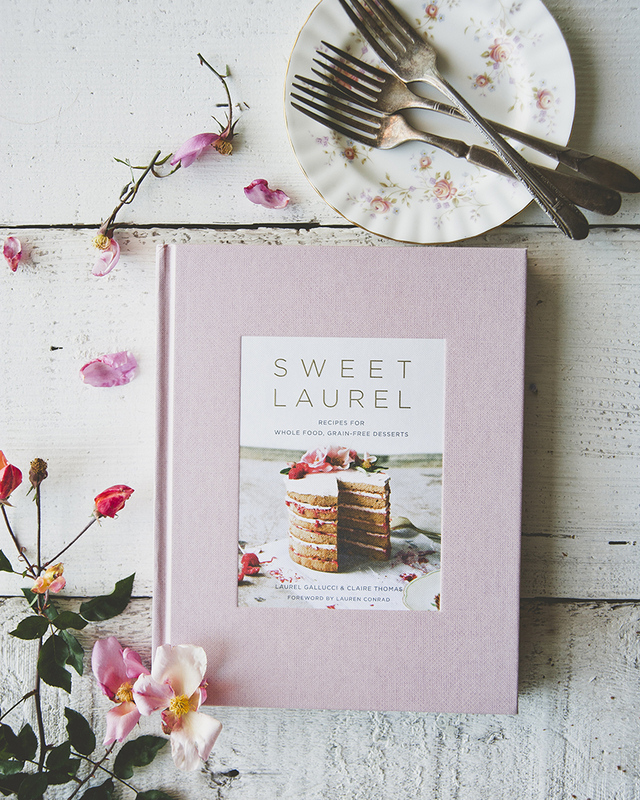 At Sweet Laurel, we like to keep it simple, and not to mention, deliciously gluten-free, grain-free, refined sugar-free and dairy free! Two years after being diagnosed with an autoimmune disease (Hashimoto’s), I decided to do something about it. When I was diagnosed in 2012, my doctor immediately put me on synthetic thyroid hormones to stand in for the hormones my body was not creating. Every morning I popped my pill and went on with my day-to-day activities, all while ignoring my body’s screams for help. Two years later, I was suffering from extreme IBS, a myriad of digestive issues and secondary amenorrhea. I came face to face with the reality that I could not put my health off another year; I needed to take action. I met up with a family friend who practices functional medicine and she introduced me to the concept of healing through food. She suggested I remove inflammatory foods from my body/diet: grains, dairy, refined sugar, soy, and legumes. Hashimoto’s disease has a long-standing negative relationship with gluten, which mimics the thyroid hormone in some cases. Removing gluten as well as other inflammatory foods was the first step in taming my thyroid, as well as healing my gut. I removed foods causing inflammation, as well as processed foods and educated myself in a whole-food approach to eating. I started by eating whole vegetables, fruit, and organic and pasture-raised protein. I quickly learned if I wanted certain foods, like crackers or cookies, I had to make them myself. 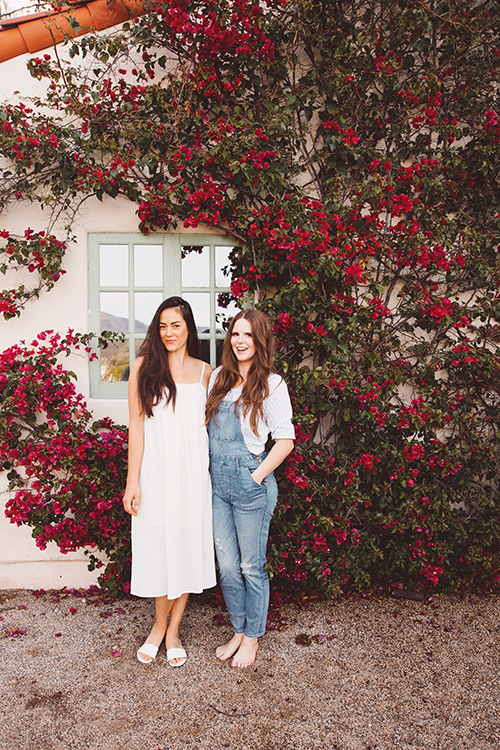 This was when Sweet Laurel became more than just a thought. I started to work with foods I could eat, like almond flour and coconut oil, as opposed to flour and butter. I fell in love with Himalayan pink salt for balance of flavor in my cooking and baking, and instead of table sugar, I sweetened my baked goods with maple syrup. In most recipes, I used organic and pastured eggs or found they weren’t needed at all! I kept it simple. I discovered the beautiful reality that a whole-food approach to eating doesn’t have to be complicated. In 2015, using these five core ingredients, I launched Sweet Laurel with the goal of sharing this approach to eating with as many people as possible. Here is a simple yet beautiful recipe I love to share with friends on late summer nights. The elegant topping of whipped cream and berries is a classic. Recipe Note: Make sure to let the coconut milk set in the refrigerator at least 8 hours, or overnight, before making the coconut whipped cream topping. I always keep multiple cans of coconut milk in the back of my fridge so I can whip up this quick and delicious dessert! Prepare your 8-inch pan by cutting a circular round of parchment paper to fit the base of your pan. Place the circular parchment round inside the cake pan, then grease the sides of the pan with melted coconut oil. Place eggs*, coconut oil, maple syrup and vanilla extract in a bowl. Whisk until well incorporated. Add almond flour, salt, and baking soda. Mix until batter is formed, then pour into prepared pan. Bake about 25 minutes (or 35 minutes, if using egg replacement), until toothpick inserted comes out clean. Allow to cool, then flip cake out of pan onto a cake plate. Place the freshly ground chia and flax seeds in a bowl, then add water. Allow the mixture to sit for 10 minutes, then add to the batter. This cake will need to bake for 10 additional minutes. Place can of coconut milk in refrigerator the night before you make your cake. Before you plan to serve your cake, open the can of refrigerated coconut milk. The fat will have risen to the top of the can, with the liquid at the bottom; scoop out only the solids to your mixing bowl, then add the maple syrup and vanilla extract. 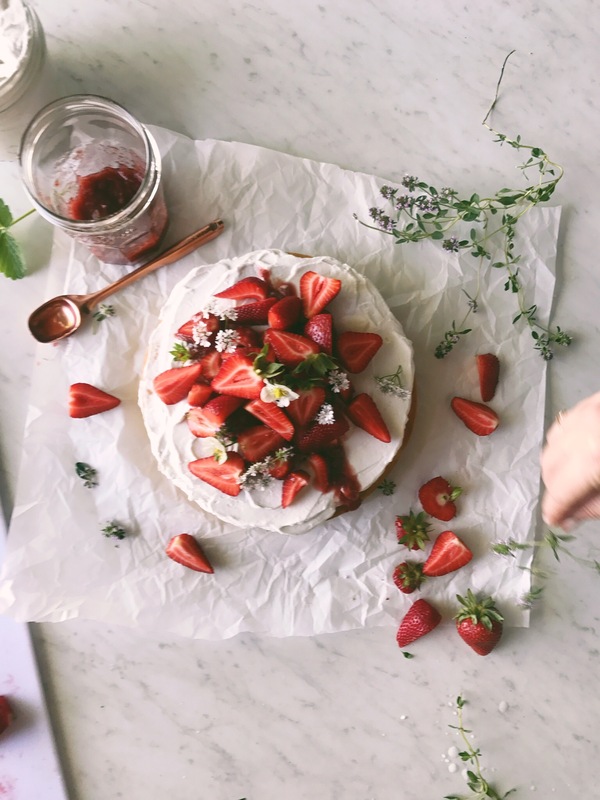 Whisk together, then refrigerate whipped cream to keep it firm until you are ready to top your cake. 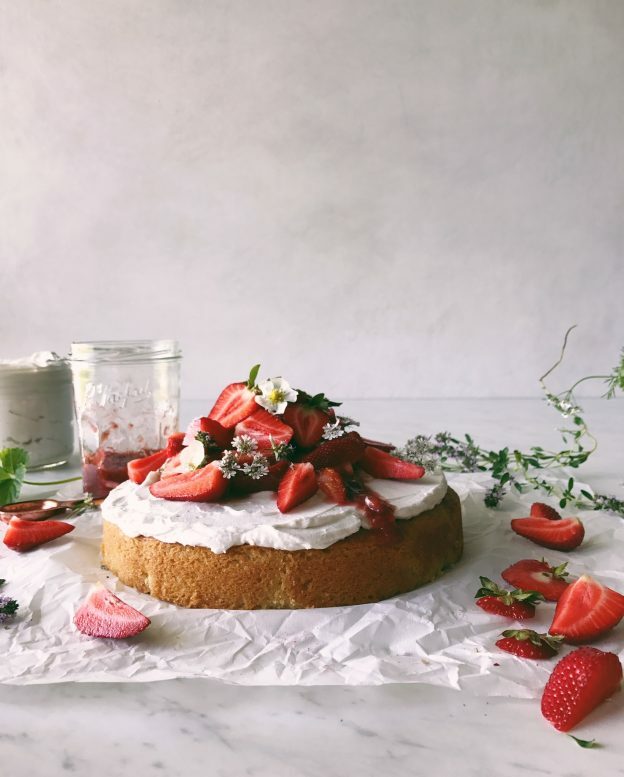 To frost your cake, place cooled cake on serving plate and top with prepared coconut whipped cream, followed by organic seasonal berries. This entry was posted in baking, dessert, diy, healthy, holidays, Uncategorized and tagged almond flour, berries, blog, cake, coconut, coconut cream, dairy free, gluten free, gluten free vanilla cake, grain free, refined sugar free, strawberry cake, vanilla cake on October 4, 2017 by sweetlaurel. Thank you so much for your recipes! I was diagnosed with hashimotos as well this year. I love to bake for others but found that I wasn’t able to enjoy what I was baking. I’ve made several of your recipes and love all of them! Would it be possible to make cupcakes with this same recipe? Most definitely! Just line a cupcake tin with cupcake liners and bake for about 25 minutes. This should yield 12-15 standard sized cupcakes. One of my daughters made this cake once with whole raw almond flour and once with blanched almond flour. I loved both! I actually preferred the texture and flavor of the unblanched almond flour cake. Question: which is more healthful, and why? Another question: is there another nut flour that would work as well? According to Integrative Medicine assessment I have sensitivity to almonds. Thank you for reaching out! So happy to hear you and your daughters are enjoying our recipe! I love this cake! Unblanched almond meal is simple ground almonds with the brown skins still enacted. Blanched almond meal is made with almonds where the brown skin of the almond has been removed. The health benefits of both flours are very similar, and the one difference I’d note is the unbalanced almond meal is higher in fiber possibly. Hey, what is your method for fresh grounded chia/flax seeds? Also do you think packaged ground chia/flax seeds would work? Hi Natalia! I like to freshly grind the chia and flax in the Vitamix or high power blender. Freshly ground works best because it allows for optimal ‘congealing’ between the seeds and water, which will act as a binder when replacing the eggs. Hi there! I’ve just made this lovely looking cake—it’s cooling on my counter right now. I noticed that my cake didn’t rise much at all—or rather, it rose in the oven but deflated as it cooled. My baking soda was fresh/active, and I think my oven temperature was accurate (I have an oven thermometer, though it’s probably not a great one). The height of the finished cake is, I’d say, about 1-inch tall. Does that sound about right, or might something be off with my oven or otherwise? HI! So happy to hear you’re enjoyed this cake!!! This cake doesn’t rise much, but if you’d like a taller cake, I would recommend making the cake in two 6 inch pans. ENJOY! Hi, I’m wondering if the coconut whipped cream you use in your recipes would hold to frost a three layer cake, on the inside and outside, enough to have a smooth finish?? You would definitely have enough if you double the recipe! Happy baking! Totally! I do it all the time. Your cakes look beautiful!! and I’m excited to try some of your recipes out. What brand of maple syrup do you like to use? I have a few at home that I love and that I mostly use for pancakes but they are very expensive (up to $30 a bottle) and I’m wondering if there’s a better option for baking, similar to the way one might save their best olive oil for finishing and not cooking. Thanks in advance! And I’m sorry if you’ve addressed this elsewhere in your site – I couldn’t find the information when I searched. Hi Shai! The only specific details I like to specify regarding maple syrup is that it is 100% maple syrup. We get ours from a very cute family farm in Vermont called Butternut Mountain Family Farm. Costco has a great brand, and so does Sprouts. Whole Foods and Safeway have 100% maple syrups as well. Hope this helps! I love the cookbook – recipes are delicious and photography is amazing! It’s so nice to have so many options for dessert and not feel as though you’re missing out. I do have one question though. Many of the recipes call for Almond flour and only very few have other gluten free options (oat, coconut, etc). Due to the cost of Almonds and Almond flour, is there another similar alternative I could use as a substitute for this type of flour that would produce the same result? I’m fairly new to gluten free baking so I appreciate any advice. Hi Brittany, thank you for the kind words! Almond flour is used because it provides so much moisture, texture and crumb. It can be expensive, and if you’re looking for a cheaper option, I’ve found online places like Honeyville.com or Costco to be the best bang for the buck. We use coconut flour in a handful of recipes (vanilla coconut jam cake, orange pistachio loaf) and it is much cheaper. In most of the cakes, you can swap coconut flour for almond flour but it is NOT a one for one swap. In the cookbook I advise that if you choose to do this swap, for every cup of almond flour, you sub 1/4 cup of coconut flour plus an additional egg. This works in most of the cakes. Hope this helps! I LOVE your work! It’s beautiful and doesn’t compromise on flavor! Quick question on the coconut whipped cream – if I assembled the night before or morning of and then served it at dinner, would it hold up that long? Or is it better to do right before? Is the egg replacement on this just the one flax or chia egg, or do you double that? Thanks! For each egg, sub 1 flax or chia egg. So this recipe = 2 flax eggs.